John Pemberton was a man with one great obsession: he wanted to invent the ultimate medicine and the perfect drink all rolled into one. Although he had invented numerous patent medicines and owned a successful chemist's store, his chief interest in life at the age of fifty was the possibility that a new patented drink could make him a fortune and earn him a place in the annals of scientific history. Pemberton was wildly excited by reports of the virtues of the coca plant. The coca plant had been chewed by the natives of Peru and Bolivia for over 2,000 years and was reputed to act as a stimulant, aid to digestion, aphrodisiac and life-extender Accordingly, he decided to attempt to base his new drink around it. Indications that the cocaine found in the coca-leaf could prove addictive were generally ignored. Even the renowned psychologist Sigmund Freud enthused about the virtues of the leaf in his essay ber Coca, a 'song of praise to this magical substance". The coca leaf had already been used as an ingredient in a coca wine, Vin Mariani, a hugely popular drink invented by the Corsican Angelo Mariani which enjoyed huge success in Europe and the United States. Mariani made great use of celebrity testimonials to advertise his product, citing Thomas Edison, Émile Zola, Queen Victoria and no fewer than three Popes in praise of his product (Pope Leo XIII even went so far as to present Mariani with a gold medal "in recognition of benefits received form the use of Mariani's tonic"). In 1885 Pemberton launched his own competing brand, "Pemberton's French Wine Coca", a drink advertised as an "intellectual beverage" and "invigorator of the brain". He improved on Mariani's drink in that he added the kola nut - also famed for its medicinal properties - and damiana, reputed to be a powerful aphrodisiac. His advertising pushed the drink as a nerve tonic, and recommended it as an aid to overcome morphine addiction. He did not mention that he himself, like many medical practitioners of the time, had a serious morphine problem. Pemberton marketed this wine-based drink with great success in Atlanta, selling it as a cordial in chemists" shops. With the rise of the temperance movement, however, it became clear that it might soon no longer be possible to sell a drink based on alcohol. Convinced of the virtues of the coca leaf, and cola nut, Pemberton directed his efforts towards concocting a "temperance" drink based on these ingredients and essential oils. Pemberton began researching obsessively for a formula for a new "temperance" drink based on the coca leaf and kola nut, but replacing the wine by an assortment of essential oils. This tasted too bitter, however, and he tried adding sugar - but this resulted in a sickly sweet taste. The addition of citric acid counteracted this effect, and resulted in a palatable drink. The remodelling and equipment of this Marietta Street house absorbed all the money Uncle John had or could get The wonderful part of the equipment, to me at least, was the enormous filter made of matched flooring, wide at the top and narrowing to the base. It was built through the floor of a second story room and the ceiling of the room below. This big hamper-like receptacle was filled with Chattahoochee River washed sand, Uncle John explained. The prepared ingredients of coca cola were poured into the top of this filter and treacled through the several wagon loads of washed sand into a metal trough. My best recollection is that this process was for the purpose of "ripening" the mixture by letting it filter through without access of air. There were two large kettles such as sorghum and sugar cane juices were boiled in Paddles of ash similar to those used in propelling canoes stirred the liquid while it was boiled before being taken through the filtering and fermentation process. Pemberton laboured over the formula for the drink, sending samples down to the soda fountain at the local pharmacy to see how they would be received, and instructing his nephews to report people's comments on the new drink. When the drink was nearly ready to launch properly, Pemberton was visited by two businessmen who wanted to interest him in a colour printing device. Instead, they became partners with him in the "Pemberton Chemical Company". In a historic naming contest, Frank Robinson put the names of the two most important ingredients in the drink together to make a catchy alliterative name: Coca-Cola. Robinson brought marketing expertise to the company. He convinced Pemberton of the importance of advertising, and designed the classic Spenserian-script Coca-Cola trademark. He persuaded the inventor that it was in the company's interests to stretch to extravagances such as giving out free drink coupons as a promotional exercise. With oil-cloth banners and streetcar signs, the drink began to sell extremely well. It is not clear why exactly Pemberton then sold the rights to the Coca-Cola formula - he had developed cancer and it is possible that his morphine addiction was now very serious - but in 1887, Willis Venable and George Lowndes purchased two-thirds of the rights. He told Lowndes "I am sick, and I believe I will never get out of this bed. The only thing I have is Coca-Cola. Coca-Cola some day will be a national drink. I want to keep a third interest in it so that my son will always have a living". Little did Pemberton know that his son Charley would be dead from a morphine overdose only six years later. Pemberton's illness worsened, but he remained obsessed with perfecting the Coca-Cola formula. Several times in his dying months he struggled to his laboratory to experiment with a modified cola drink with celery extract. "He did not care anything about what he had already accomplished", one of his associates remarked, "he wanted something new". 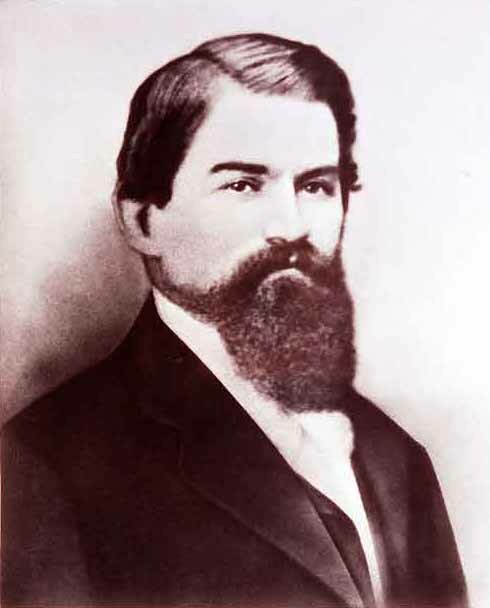 On August 16, 1888, John Pemberton passed away. His obituary described him as "the oldest druggist of Atlanta and one of her best-known citizens an especially popular gentleman". John Pemberton's obsessive search for the perfect drink is typical of the inventor and of the early stages of a corporate history. What begins as research becomes a self-sacrificing, heroic, project. One common feature of the great inventor is that they rarely profit themselves from their discoveries. Due to the poor business sense that Pemberton displayed towards the end of his career, the ownership of his idea was taken away from him, and his wife died a pauper. Little did any of them know that this once obscure patent medicine would one day become a multi-million dollar business, and come to represent the essence of American culture.